Best known for his television shows including I dream of Jeannie and Hart to Hart as well as his many novels, the Academy Award-winning American writer Sidney Sheldon sadly passed away 30 January 2007. He Was Born February 11, 1917 and in 1937, Sheldon moved to Hollywood, California, where he reviewed scripts and collaborated on a number of B movies.Sheldon enlisted in the military during World War II as a pilot in the War Training Service, a branch of the Army Air Corps,His unit was disbanded before he saw any action. Returning to civilian life, he moved to New York City where he began writing musicals for theBroadway stage while continuing to write screenplays for both MGM Studios and Paramount Pictures. He earned a reputation as a prolific writer; for example, at one time he had three musicals on Broadway: a rewritten The Merry Widow, Jackpot, and Dream with Music. Sheldon created, produced and wrote I Dream of Jeannie in his co-production capacity with Screen Gems. He wrote all but two dozen scripts in five years, sometimes using three pseudonyms (Mark Rowane, Allan Devon, Christopher Golato) while simultaneously writing scripts for The Patty Duke Show. He also used the same pseudonyms in writing all seventeen episodes of Nancy. He later admitted that he did this because he felt his name was appearing too often in the credits as creator, producer, copyright owner andwriter of these series. He also created and wrote for the series Hart to Hart. Production for I Dream of Jeannie ended in 1970 after five seasons. It was “During the last year of I Dream of Jeannie, I decided to try a novel,” he said in 1982. “Each morning from 9 until noon, I had a secretary at the studio take all calls. I mean every single call. I wrote each morning — or rather, dictated — and then I faced the TV business. 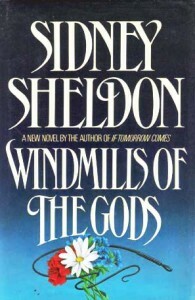 In 1969, Sheldon wrote his first novel, The Naked Face, which earned him a nomination for the Edgar Allan Poe Award from theMystery Writers of America in the category of Best First Novel. His next novel, The Other Side of Midnight, climbed to #1 on The New York Times Best Seller list as did several ensuing novels, a number of which were also made into motion pictures or TV miniseries Including Windmills of theGods. His novels often featured determined women who persevere in a tough world run by hostile men. the novels contained a lot of suspense and devices to keep the reader turning the page. Sheldon remains the seventh best selling fiction writer of all time And has also been Called “mr Blockbuster” and “the Prince of Potboilers”.